I thought country music offered America a pretty good representation of what it’s all about on last week’s CMA Awards Show. Salutes to Glen Campbell, Troy Gentry and Don Williams were all well placed, as was a tribute to the 58 country fans slain in Vegas. I could have done without the ABC-TV non-stars as presenters and the gratuitous product-placement ads. But the singing and the instrumental tracks were consistently fine. 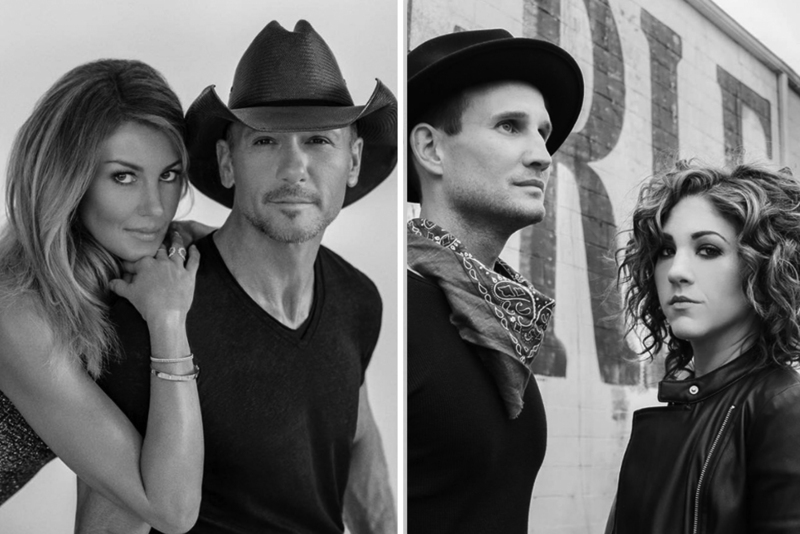 The four new songs introduced on the show (by Urban, Tim & Faith, Church, Miranda) are spotlighted in this week’s DisClaimer column. Of them, the Tim McGraw & Faith Hill enduring-love duet easily wins the Disc of the Day award. The two closest competitors are Miranda Lambert’s honky-tonk ballad and a song that wasn’t on the telecast, Jerrod Niemann’s delightful toe tapper. The DisCovery Award goes to a duo called Stranger Friends. It is comprised of John Martin and Jamie Floyd. He has penned songs recorded by Garth Brooks. She has had cuts by Ronnie Dunn and Ashley Monroe and is a former Disc of the Day winner as a solo artist. Together, they are terrific. – Everly harmonies. Slappin’ backbeat. Fabulous steel-guitar picking. Instantly catchy tune with a happy rhythm. I love, love, love this. – Booze and the Bible mix it up in this very slowly paced barroom heartache lament. Best line: “It’s a long way from Hell to Step Number 12/But I’m gonna make it there one day.” Old-school country. – I’ve always liked this guy a lot. This snappy bopper promises a gal some tunes, a pleasure drive, a drink and an open-ended evening. Irresistible. – Recorded in the Bay Area, this lacks Nashville polish. But there’s plenty of guitar twang and a dandy lyric to compensate. I wonder if lowering her key would make her a more effective vocal communicator. – Almost immediately after introducing this on the CMA telecast, Urban was derided. Late-night TV host Stephen Colbert parodied the performance on his show as “She Person” and mocked the lyric as, “the first song ever written by dumping out a bin full of inspirational throw pillows.” Last weekend, some hipster NPR panelists who only knew Urban as “the guy who is married to Nicole Kidman,” also looked down their noses at it. The fact of the matter is that the production echoes and throbs and sparkles brilliantly. Keith’s performance rings with sincerity. And what the heck is wrong with a guy identifying with feminist issues anyway? – She is sings in a throaty alto. The song is about drowning out his memory with loud music. Pass. – This has an appealingly nervous energy level, as well as some very cool soul-sister wailing in the background. Country rock with a decided edge. – The rocking track rumbles with a simple, repeated, deep-twang guitar lick. Her spitfire lead vocal should have been mixed a little hotter. – Hallelujah. Stone country from start to finish. Miranda gives it a classic honky-tonk vocal performance while the track seethes with pent-up intensity behind her. This is the right stuff.